OpenTok Feature | WebRTC voice calls for dynamic, clear voice experiences. Our comprehensive voice offering tackles the unique challenges of voice-only calls. 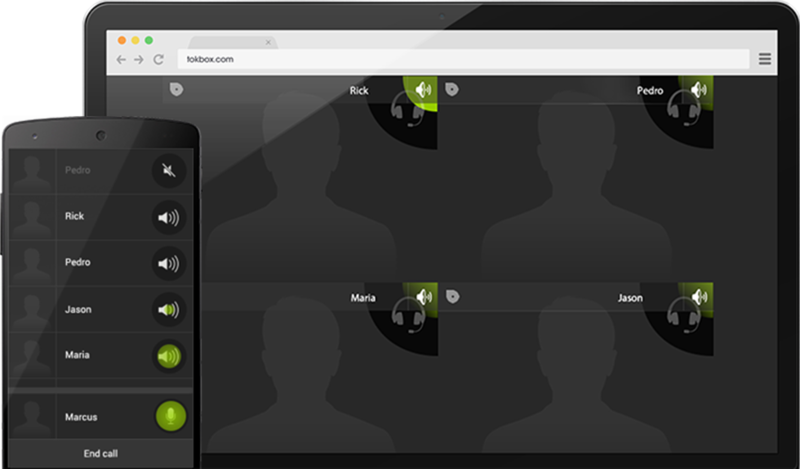 Offer clear web-based voice calls as an alternative or addition to video. Power a voice-based customer service solution complete with call queuing, holding, forwarding & more. Enable users to detect who is speaking on a multi-party call. Build a click to call capability. Engage those customers not yet ready for video calling, ensuring no one misses out on the full application experience. Create dynamic applications that place the current speaker front and center using audio detection technology. Ensure everyone knows who’s saying what. Our platform’s voice UI is optimized for web and mobile, allowing you to create a user-friendly experience with all the features you need and nothing you don’t.